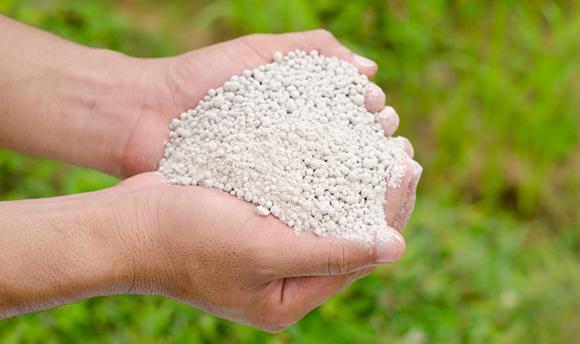 Granular fertilizers are often highly susceptible to caking and dust formation throughout the product lifecycle – during manufacture, storage, transport, and application. SurPhase FLOW coatings provide critical protection from caking and dusting on dry fertilizers, saving manufacturers, distributors, and growers time, money, and environmental concern. Caking, clumping, pile set, lumping, bag set…whatever you call it, the results are the same: Difficulty in handling and shipping; problems distributing fertilizer effectively and evenly in the field; time lost –and sometimes safety issues – trying to remove material from hardened piles in the bin; or worse yet, rejected and returned shipments of your product. Surface Chemists has developed a number of unique anti-caking technologies that are applied to the fertilizers during or after production and can help minimize moisture uptake, prevent recrystallization (“bridging”) and reduce the incidence of caking. Dust in dry fertilizer is a given. From manufacture, to storage, to shipment, to application in the field. Dust generation can be hazardous to the environment, to the safety of your plant and processes, and most importantly, to the health of your employees. Dust is not only a health and safety issue, but it also represents degradation of your fertilizer and valuable loss of product. SCF technologies can be customized to your product form, composition, and process to reduce the generation of dust and preserve your product’s integrity. Using effective anticake and dust control coatings can improve the quality and durability of your fertilizer – making it easier to sell, handle and ship, and apply. These coatings also provide safer operation and reduced downtime in your facilities. The net result for you can be higher sales and profits, increased productivity, fewer regulatory headaches, and reduced product rejects and refunds. Even the same fertilizer produced in two separate plants may be different in composition and appearance. Because of this, a one-size-fits-all coating is not a realistic solution to caking and dusting problems. Surface Chemists team of scientists, engineers and microbiologists will develop and manufacture a coating that is tailored to your fertilizer composition and your processes. That’s not a fancy sales promise. That’s just how we work. We have been doing it that way since we began in 1969 and today we proudly produce millions of pounds of coating each year for fertilizer and specialty nutrient manufacturers of all types and sizes. Would you like to learn more about what SurPhase FLOW Coatings can do for you?